In the said Order, in paragraph 2, in sub-paragraph (1), for the words �within a period not exceeding three hundred and sixty days�, the words �within a period not exceeding eighteen months� shall be substituted. Note : The Lokpal and Lokayuktas (Removal of Difficulties) Order, 2014 was published in the Gazette of India Extraordinary, vide notification number 8.0. 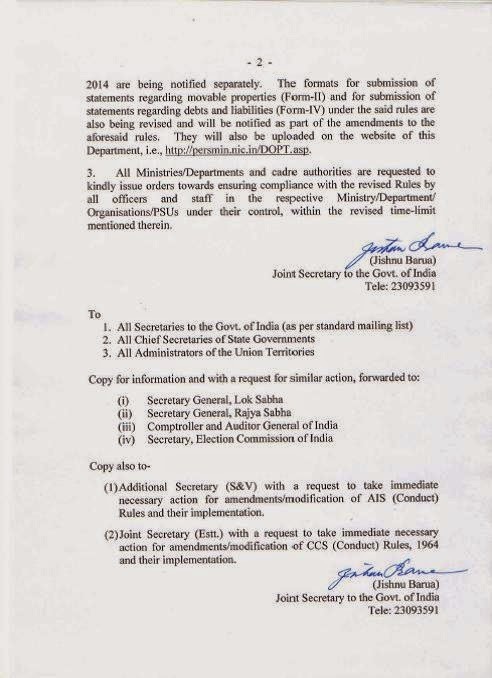 409(E), dated 15th February, 2014 and amended by Order, dated 14th July, 2014 published vide notification number 8.0. 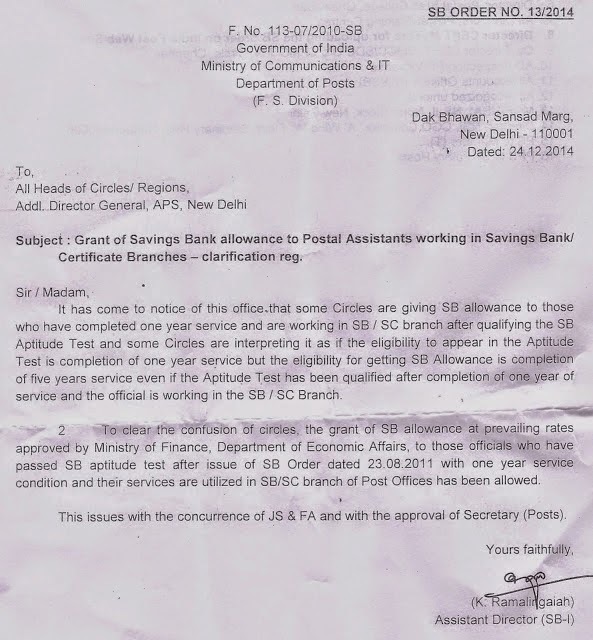 1840(E) dated lSth July, 2014; and by Order dated 8th September. 2014 published vide notification number 8.0. 225605) dated 81h September, 2014. 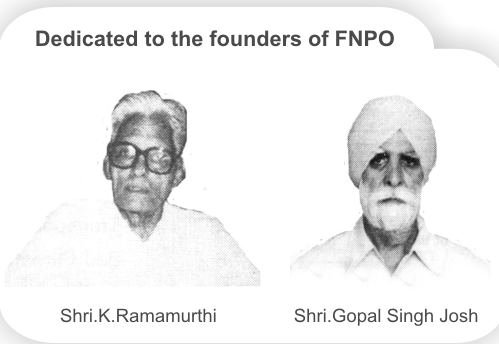 A delegation of FNPO leaders under the leadership of Sri. T V Chandramohan, Ex - MLA, Chairman FNPO Thrissur District Committee and Johnson Avokkaran, met the Hon'ble Minister at Guruvayur and submitted a memorandum regarding Circle Level and local Issues. The minister was kind enough to have a fruitful discussion. 1)Protection of TRCA of GDS. 2)Filling up of vacant posts in all cadres including that of CPMG and DPS NR. 3)To effect relaxation recruitments in all cadres in the Circle without delay. 4)To keep in abeyance the hasty decision of the Circle administration to set up Post Shoppies in the Circle. 5)Allot funds for building Kunnamkulam HO Building. 6)Allot funds for repairs of Staff quarters at Poothole, Thrissur Division. The delegation consisted V K Mohanan(D/S NUGDS) and C J Wilson(Divisional Vice president, P4). Minister agreed to do all possible help on the demands. i. The medicines are to be issued as per the CGHS Formulary and guidelines issued by this Ministry in this behalf. ii. In case the prescribed medicines are not available in CGHS formulary, but are essential for the treatment of the patient, they can be issued / indented by the doctors of the CGHS Wellness Centre on the basis of a valid prescription of the authorized specialist subject to the condition that such medicines are neither dietary supplements/ food items nor banned drugs. Instructions on this issue i.e., non-admissibility of food items etc. issued vide O.M .No. 39-3/2003-04/CGHS/MSD/RS dated 23rd July 2009 and 3rd August 2009 must be followed. iii. In case of anti-cancer drugs and other life-saving drugs that are not approved by the DCG1 for use in India, each case should be considered by the Expert Committee under the Chairmanship of Special DG(DGHS). iv. The technical Standing Committee constituted vide 2-2/2014/CGHS(HQ)/PPTY / CGHS(P) dated 27.08.2014 of this Ministry will review addition or deletion of drugs in the CGHS Formulary/ list of Treatment procedures / investigations / listed implants. The Technical Committee will meet once in three months or as per need, whichever is earlier. In the meantime reimbursement for unlisted procedures / implants will be made at the rates approved by AIIMS/GB Pant Hospital / actuals, whichever is less. 2. The O.M. 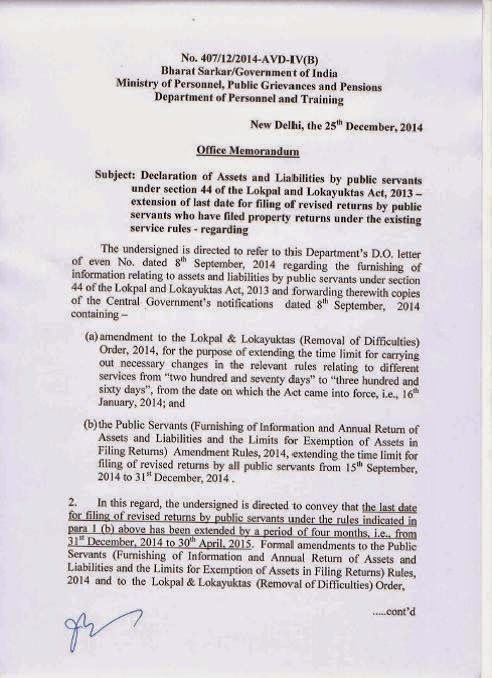 of even number dated 25.08.2014 is superseded to the above extent while O.M. of even number dated 1.10.2014 is withdrawn. Subject : Change in date of birth/age of family pensioners for payment of additional pension. (i) Since the date of birth/age of the armed forces personnel is recorded in the PPO on the basis of service records and the date of discharge/retirement/superannuation etc is determined on the basis of this date of birth/age there would be no question of allowing change in the date of birth/age of the retired/deceased pensioner in the PPO. The matter has been examined further. Considering the difficulty in producing any of the above mentioned documents as proof of age by the old pensioners. It has now been decided that the Aadhaar Card issued by UIDAI may also be accepted as proof of date of birth/age for payment of additional pension/family pension on completion of 80 years of age or above. (ii) The request for change of date of birth/age of the family pensioner (Parents and Spouse) in the PPO may be submitted by the armed forces pensioner/family pensioner, to the concerned Record Office in case of JCO/Ors and, service HQrs in case of Commissioned Officers along with at least one of the documents mentioned in Para I above/Aadhaar Card and declaration on a non-judicial stamp paper regarding the correct date of birth of the family pensioner. If the Head of the Department/Record Office is satisfied then the change in the date of birth of the family pensioner may be allowed provided a bona-fide mistake has been made in recording the date of birth in the PPO. As the entry in the PPO needs to be rectified, it would be carried out by PSA by issuing the Corr PPO on the advice of OIC Records/Head of Office. (iii) No other document except as indicated in Para 1 above and Aadhaar Card issued by UIDAI will be accepted for change in date of birth/age of the family pensioner in the PPO. 3. In order to avoid any possibility of recording an incorrect date of birth in the PPO, in future the Armed Forces Personnel would be required to submit one of the documents indicated / in Para 1 above or Aadhaar Card issued by UIDAI as proof of date of birth of spouse or parents along with the details of family as indicated in service records of service officer / personnel. In the case of children, certificate of birth from the Municipal authorities or from the local Panchayat or from the head of a recognized school if he/she is studying in such a school or from a Board of Education may be accepted as proof of age. 4. This issues with the concurrence of Ministry of Defence (Finance) vide their ID No. 31(7)/09/FIN/PEN dated 21/11/2014. Declaration of Assets and Liabilities. INCENTIVE TO THE STAFF PERFORMING IMTS TRANSACTIONS IN POST OFFICES. The central Government Employees those who are on the verge of Retirement are having many doubts about joining CGHS after retirement. Many queries have been raised by our viewers about registering with CGHS and availing the CGHS facility after retirement. Hence the details of joining CGHS and entitlement for availing treatments and its benefits, list of empanelled Hospitals are compiled and given under for viewer’s reference. All Central Government pensioners/family pensioners who were eligible for taking treatment under the Central Government Health Scheme (CGHS) while in service are eligible for availing CGHS facilities after retirement, irrespective of whether they were or were not availing CGHS facilities while in service. Further, it is not necessary that these pensioners / family pensioners should be living in the areas covered under the CGHS. 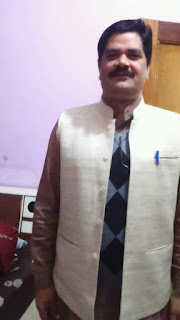 Allahabad, Ahmedabad, Bangalore, Bhopal, Chandigarh, Chennai, New Delhi, Faridabad, Ghaziabad, Gurgaon, Guwahati, Hyderabad, Jaipur, Jabalpur, Kanpur, Kolkata, Lucknow, Meerut, Mumbai, Nagpur, Noida, Patna, Pune, Shillong, Thiruvananthapuram. The Central Govt. Health Scheme provides comprehensive health care to the CGHS Beneficiaries in India. The medical facilities are provided through Wellness Centres (previously referred to as CGHS Dispensaries) /polyclinics under Allopathic, Ayurveda, Yoga, Unani, Sidha and Homeopathic systems of medicines. The pensioners / family pensioners have to get their names registered with any of the CGHS dispensaries after submitting an application in the prescribed proforma for the issue of a CGHS identity card. 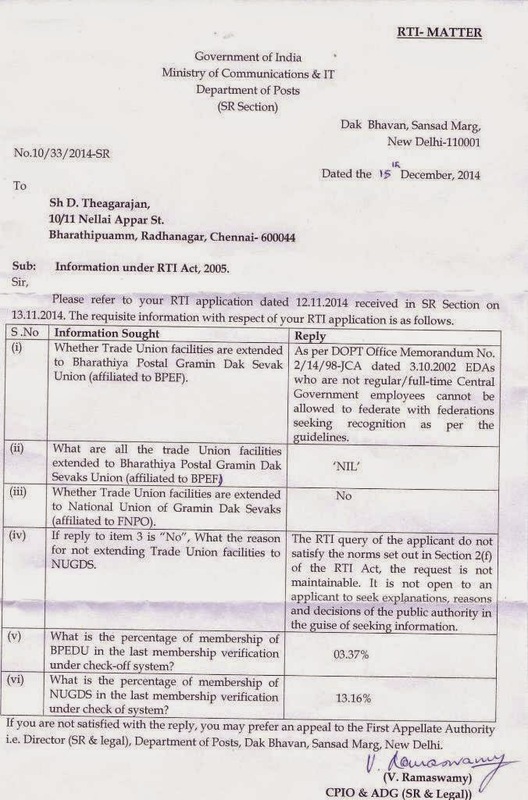 BEDU : Not Recognized - No Trade Union Facilities - Department clarified to our RTI. Since assuming charge of Secretary(Staff Side), National Council(JCM), I have repeatedly demanded to convene a meeting of the National Council(JCM). It is, however, regretful to point out that, despite all out efforts made by me and requesting you in person to hold the meeting, no meeting of the NC/JCM has been convened till date. It may be appreciated the Joint Consultative Machinery(JCM) at the National level, conceived as an effective Negotiating Forum, has virtually become defunct as no meeting of this forum has been held during the last four years, with the result that, a number of major grievances of the Central Government employees continue to remain unresolved, because of which they are badly agitated. The procrastinated discussions in the National Anomaly Committee did not proceed to settle any tangible anomaly item. Even after reaching agreement, the government has refused to issue orders on some issues. This apart, the demands raised by the Staff Side for grant of Interim Relief and Merger of DA with Pay have been refused by the government. One of the vital segments of the Central Government Employees, i.e. Grameen Dak Sewaks of the Postal Department, are kept outside the ambit of the 7th CPC. Unilateral decisions were taken to induct FDI in the Railways, Privatize the Railway and Defence Production Units; closure of the Printing Presses, Publication and Stationery Departments; contractorise the medical store functions; corporatize the Postal Organization and outsource various governmental functions. Under these circumstances, all the constituents of the National Council(JCM)(Staff Side) had to hold a “National Convention” on 11th December, 2014 in New Delhi, wherein after detailed deliberations and taking stock of the situation, a detailed programme of struggle has been chalked-out. In case there is no positive response from the Official Side, it will ultimately lead to indefinite strike. A copy of the Declaration of the above-mentioned Convention is enclosed herewith, which is self-explanatory. We do fervently hope that negotiation is possible even at this late stage and would therefore urge upon you to take concrete steps in that direction. We also hope that you will be able to appreciate that any decision of the government which affects the job security of the employees adversely need to be discussed and agreement reached at the JCM Forum. I would, therefore, request you to personally intervene in the matter, being the Chairman of the National Council(JCM), so as to avoid serious unrest and disturbance to industrial peace in the Central Government Services and hold discussions with the Staff Side, NC/JCM on these vital issues at your earliest. (b) if so, the reasons for such kind of injustice with passengers? (a)&(b): In order to improve the earnings from passenger services, w.e.f. 01.10.2014, in some of the selected trains by Zonal Railways which are most in demand, 50% of the existing accommodation under Tatkal Quota has been earmarked as Premium Tatkal Quota and is being booked on dynamic pricing. This is a distance-slab based fare scheme where the fare increases by 20% after each slab of 10% berths are sold subject to a cap (maximum fare chargeable). Tatkal is a facility over and above the normal booking of reserved seats/berths. Subject : Alteration of date of birth of a Government Servant — reiteration of the instructions. Rule 56 of Fundamental Rules states that except as otherwise provided in the rule, every Government servant will retire from service on the afternoon of the last day of the month in which he attains the age of sixty years. Provided that a Government servant whose date of birth is the first of a month shall retire from service on the afternoon of the last day of the preceding month on attaining the age of sixty years. (c) the date of birth so altered would not make him ineligible to appear in any School or University of Union Public Service Commission examination in which he had appeared, or for entry into Government service on the date on which he first appeared at such examination or on the date on which he entered Government service. “Inordinate and unexplained delay or laches on the part of the respondent to seek the necessary correction would in any case have justified the refusal of relief to him. His inaction for all this period of about thirty five years from the date of joining service, therefore precludes him from showing that the entry of his date of birth in service record was not correct”. 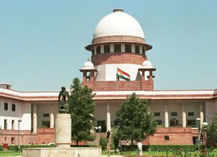 The observations of the Apex Court was also circulated to all Ministries and Departments of the Government of India vide OM No.19017/2/92-Estt. (A) dated 19-5-1993. 4. All the Ministries and Departments are requested to keep the above in view while processing cases of requests for changes of date of birth.